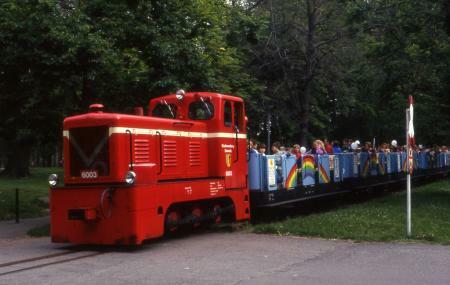 The Parkeisenbahn Chemnitz is a 2.3-kilometre-long, narrow gauge children's railway in the town of Chemnitz, Germany. This railway line has one station, two stops, one depot and one block post. A great place to visit with your kids, all the jobs here are done by kids and teenagers, except for the engine driver and the station master. The miniature railway is the highlight of this park. Also present here is a garden where the entire family can relax and set up a picnic. Seniors travel Tuesday to Friday (except for holidays) at reduced rates. The mentioned ticket price is for one adult for one tour. For more ticket prices, season tickets, discounted ticket prices, visit their website. The attraction is closed on Monday (except for public holidays). How popular is Parkeisenbahn Chemnitz? People normally club together Das Chemnitzer Rathaus and Galerie Roter Turm while planning their visit to Parkeisenbahn Chemnitz. It's nice place to be visiting with the children. Sehr nette "Bahnmitarbeiter". Die Jugendlichen, auch die Erwachsenen, machen das toll!! Wunderschöne Bahn. Tolles Erlebnis für Jung und Alt! Auch die Preise sind in Ordnung. Der Park lädt zum Verweilen ein! Danke für den schönen Tag.